We’d love your help. Let us know what’s wrong with this preview of Root by Lloyd Matthew Thompson. Looking upon a sea of twisted and angry faces, his first memory in this new reality is nearly his last. But what is this reality? And why is he here? Root is an emotional journey of love, fear, loss, and exactly what it means to be alive. The Energy Anthology is a series of separate yet connected stories, each illustrating the seven different energy Looking upon a sea of twisted and angry faces, his first memory in this new reality is nearly his last. The Energy Anthology is a series of separate yet connected stories, each illustrating the seven different energy centers within our bodies-- our chakras. 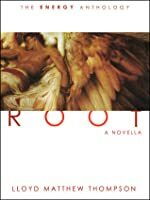 To ask other readers questions about Root, please sign up. FROM GROWING UP IN a strict and sheltered Protestant Christian household to exploring and experiencing many Ways including Buddhism, Shamanism, Paganism, New Age, and good old Life, LLOYD MATTHEW THOMPSON has clearly been shaped by each path in many ways. As the oldest of nine home-educated children, he became accustomed to a self-motivation and independence that drives him to this day, even when FROM GROWING UP IN a strict and sheltered Protestant Christian household to exploring and experiencing many Ways including Buddhism, Shamanism, Paganism, New Age, and good old Life, LLOYD MATTHEW THOMPSON has clearly been shaped by each path in many ways. As the oldest of nine home-educated children, he became accustomed to a self-motivation and independence that drives him to this day, even when surrounded by pressing influences. Whether writing, painting, drawing, or teaching, Lloyd has committed to and strives to embody and exemplify the mantra he has found at the heart of all things: And the bottom line is Love. Lloyd Matthew Thompson has written for various metaphysical and holistic blogs and magazines, both locally and globally. He is the author of the nonfiction works LIGHTWORKER: A CALL TO AUTHENTICITY and ENERGYWORKER: A CALL TO EMPOWERMENT, as well as the fiction works THE HEALER: A NOVEL, ROOT, and AURA: A SHORT STORY. He is currently working on his next full-length book, entitled THE ENERGY OF GOD.